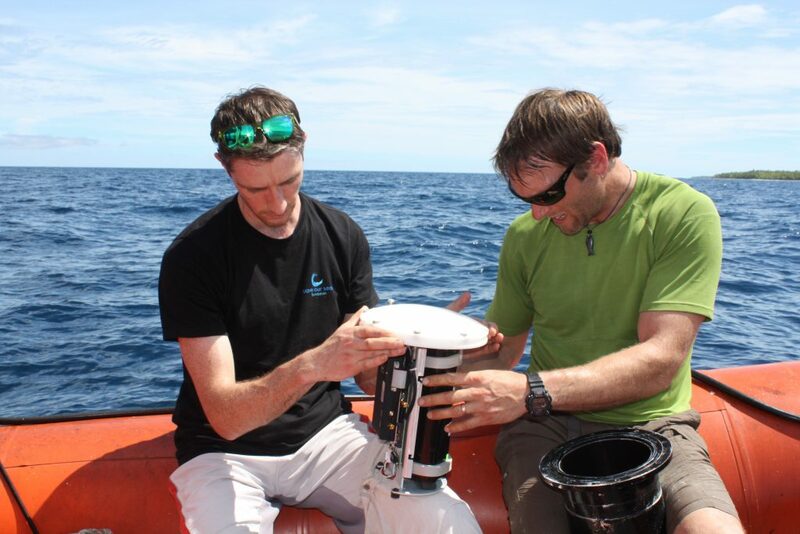 In late April and early May, Dr David Jacoby of the Zoological Society of London and Dr Taylor Chapple of Stanford University spent a week at sea attempting to retrieve data from deep-sea receivers scattered across the marine reserve in the British Indian Ocean Territory. The receivers pick up signals from pelagic animals that the team tagged on previous trips including sharks, rays and tuna – the big predators that are hard to study but absolutely key to a healthy ecosystem. These 16 receivers were deployed in 2016 in a variety of deep-water habitats such as sea mounts and undersea canyons, places too deep for divers and until now virtually unstudied by scientists. In just six days, with the help of the crew of the British Patrol Vessel Grampian Frontier, the team traversed the Chagos Archipelago from end to end travelling over 500 miles. They managed to retrieve 12 of the 16 receivers by using an automated acoustic release system which ‘calls’ the receiver from the surface causing it to break free of its mooring and float up to be collected by the team. Early analysis of the data from the receivers has revealed an incredible wealth of information; over 500,000 individual detections were downloaded – each one an individual pass of a tagged animal past one of the receivers. Receivers located at the Schwartz and Sandes seamounts in the south of the archipelago made detections of 159 unique individuals and are starting to reveal some of the connectivity between these deep habitats. Dr David Jacoby and Dr Taylor Chapple service and replace the battery in a VR4 acoustic receiver, just south of Peros Banhos in the Chagos Archipelago, so that it will continue transmitting live data for another year. Additionally, an Acoustic Doppler Current Profiler, retrieved from ‘Manta Alley’ at Egmont Island has collected information about the current profiles of this newly discovered manta highway and will provide vital environmental data for assessing why this area if so important for this iconic species. Though short, this trip was very successful and will reveal more of the habitats and movements of these amazing species around this huge marine protected area. The acoustic receiver array, funded by the Bertarelli Foundation, is contributing to a long-term data set that is unparalleled in its size and geographic coverage and continues to grow by the day. All the data are now on their way back to the lab at Stanford University for in-depth analysis.